I just couldn't stand it anymore. Remember, the beautiful yard and garden at our last house? 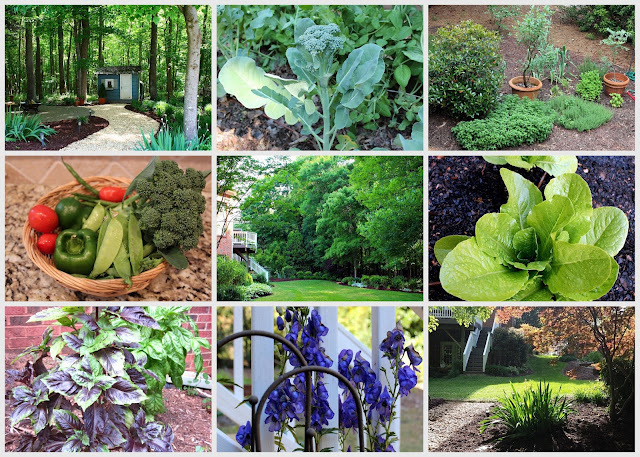 There were raised beds filled with lettuce, broccoli, tomatoes and potatoes, a little herb garden, lots of flower beds, some woods and a winding path down to a creek. What wasn't so lovely, was taking care of all that. So we downsized both the house and the lot this summer. We were so happy that we wouldn't have the big job of spreading 360 bags of mulch every Spring- snd we still are. But, it wasn't long until I missed walking outside and picking some fresh herbs when I made Italian meat sauce, especially when everyone seemed to be posting their beautiful fresh produce straight out of their gardens. 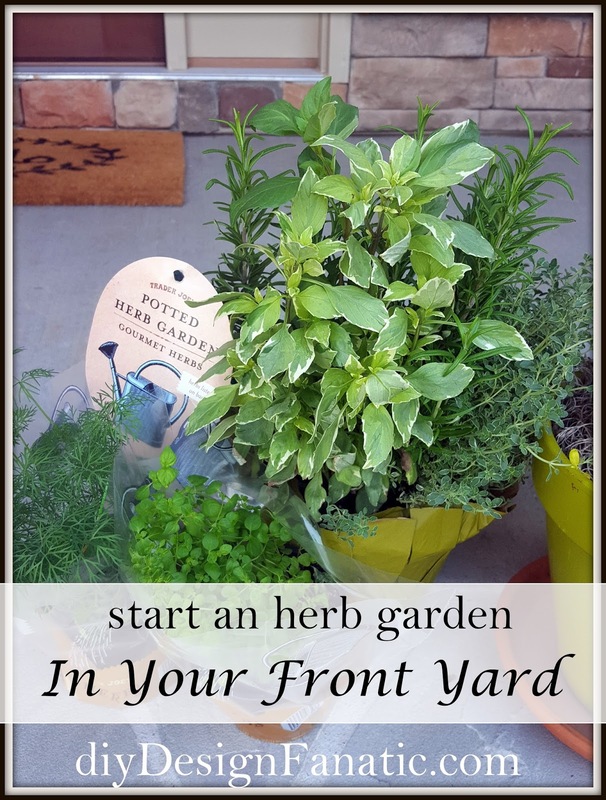 Growing a few perennial herbs would be easy to grown and very little work, in just a little patch of dirt in our yard. Isn't that the way things start? 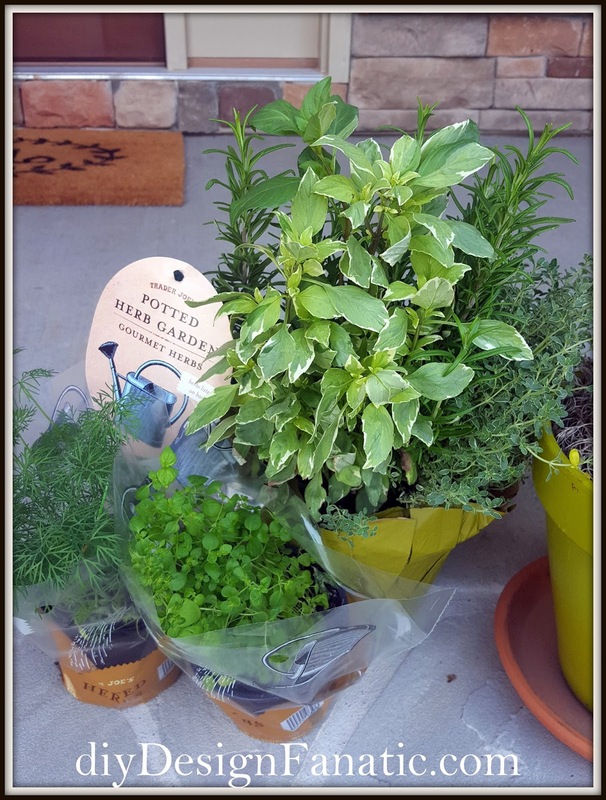 I just couldn't resist walking past some wonderful smelling herbs at Trader Joe's last week and came home with several of them. At first, I thought I'd start my herb garden in a corner of our backyard, but there were too many reasons not to. 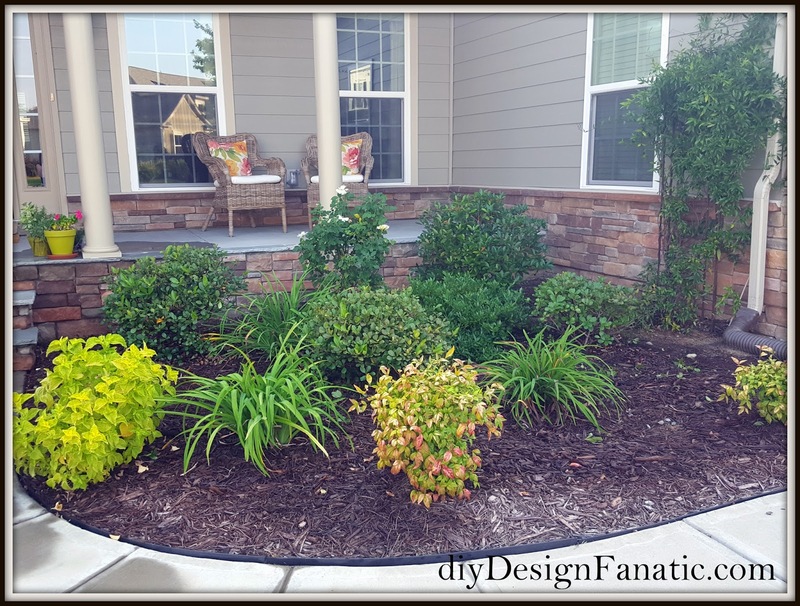 For one, the backyard is in a natural state without ANY plants or flower beds. There are a couple of builder trees planted next to the natural wooded area, but I didn't want to have to dig up the little herb garden when we did something with the backyard next year or in a couple of years. 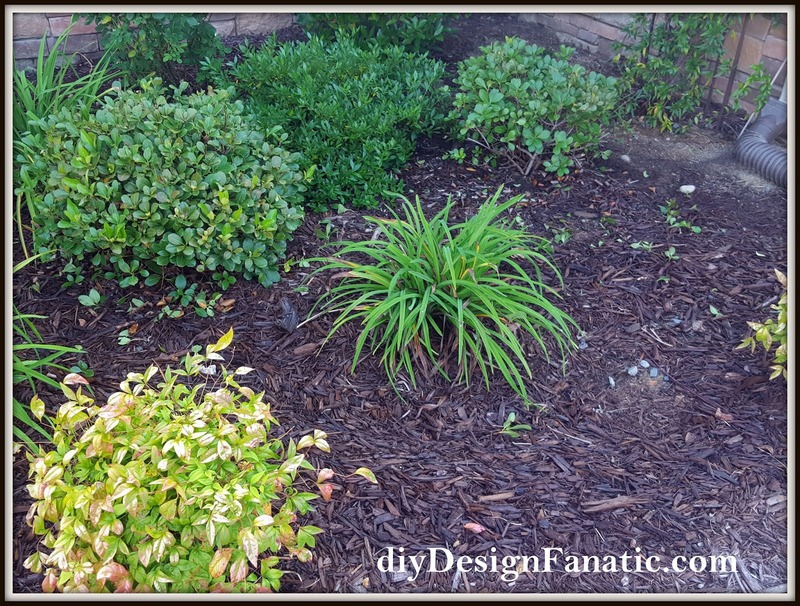 The front bed was perfect for some herbs, since it's not too big, gets a good amount of light and the afternoon sun is shaded by the house. I resisted the urge to dig up all the plants and shrubs and start all over again. The only plant I moved was one daylily. The soil here is really rocky and I'm glad I didn't dig up all the plants. The little holes were difficult enough. Since the soil was so bad, I dug a larger hole than is normally needed and filled it with organic potting soil. Then I planted the herbs. This oregano smells so good and is a really pretty plant. It's a perennial plant and will stay green all year long. I planted a second, non variegated oregano next to it. Rosemary grows a little taller and wider, so I planted it off to the side. Thyme is another really pretty plant that takes little care and grows rather "tidily" I only had to trim it once a year and very little at our last house. It's a great herb for soups and looks pretty cut for small bouquets. I need to go back and get 2 or 4 more thyme plants to make little row of them along the edge of the walkway. The last herb I bought was dill. Dill is an annual plant, so I will have to take this one indoors before the first frost. All the other herbs are perennials. The big box stores are having a $2 a bag on their mulch, so we went ahead and spread it since the old mulch was looking a little tired. This bed only took 11 bags - We're estimating that to do our whole yard currently will only take 32. That's a lot less than 360! I love this idea Pam....very pretty!!! Yes, I hear you! It would be very very hard to not dig in and start!! You've done a nice (small) job to start and, especially with this hot summer and fall, I'm sure that's plenty. And actually, Pam, just remember that the gardens are mostly looking pretty sad this time of year....so hold off until spring! When it cools down a bit we're going to clear a few pine trees in the backyard, but we won't start creating flower beds along the back perimeter until next Spring. Outside is so manageable and it takes little effort to keep things looking perfect. I LOVE that! New project is looking good! Best wishes.